This year, we judged and awarded the Aungshuk Ghosh e-Learning Prize during the Student Excellence in Medicine event. Two students were shortlisted, both of whom had already won prizes for their nominated projects at the recent student e-learning conference at Belfast Medical School. Simi designed an e-tutorial to help students gain a basic understanding of prescribing principles that will help them prepare for face to face teaching sessions in the clinical academies. Simi was keen to produce an engaging teaching and learning project, and used Adobe Captivate to create an interactive drug chart for students to complete and receive feedback on their attempt. Simi produced the project as part of her year 3 external SSC. Since then, she has completed an evaluation study of the resource, and worked with her supervisor, Dr Andrew Stanton (Swindon Academy) to edit and release the e-tutorial into the year 5 curriculum. Open Simi’s pre-prescribing e-tutorial (UoB access only). Richard developed a teaching app to educate training grade doctors about Implantable Cardioverter Defribrillators, or ICDs. 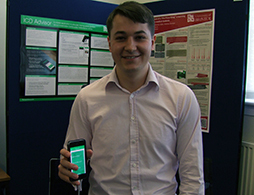 The app, designed entirely by Richard as part of his year 3 external SSC, was only part of the reason he was shortlisted. In addition, Richard used analytics gained from users testing the app to further improve the design. He also built an extension of the app that provides embedded Pubmed searches (he has since released this as an open source API. To ensure that the app is always up to date, Richard designed and used a platform that enables non-technical staff to build and update content for future apps. The platform can produce apps for multiple systems, such as iOS and Android, within the same project. The ICD app will be released into app stores in due course. His project was well made and forward-thinking, and we hope to work on mobile projects with Richard in the future. Bristol medical students – become a student technology ambassador! Would you like to help shape the use of technology in your teaching and learning of medicine at Bristol? We would like to invite our Bristol medical students to be a student technology ambassador, help peers and teachers to use technology effectively and develop a technology in learning network, set up by the Faculty e-learning team. Read this blog post for further information about what is involved and projects you could participate in. Please feel free to contact me to discuss any aspect further. (j.williams@bristol.ac.uk). If you would like to be part of the network, please let us know by Friday 1st May 2015. As part of this year’s LiTHE placement for our Medical Students in Year 2, we are running a Social Media & Facebook workshop to help promote good practice of social media, leading towards the development of a ‘professional identity’ online. Where needed, we can assist students segment the content they share and generate between different audiences, i.e. close friends, acquaintances, and the general public. We will be talking specifically about how to go about this on the Facebook platform, and how to clear up old profiles on other sites if needed. We will also discuss useful tools and services to help manage information about you online. Google have a useful page in their accounts section called “Manage Your Online Reputation” which can help people manage information about them which might be accessible through their search engine and social media service.